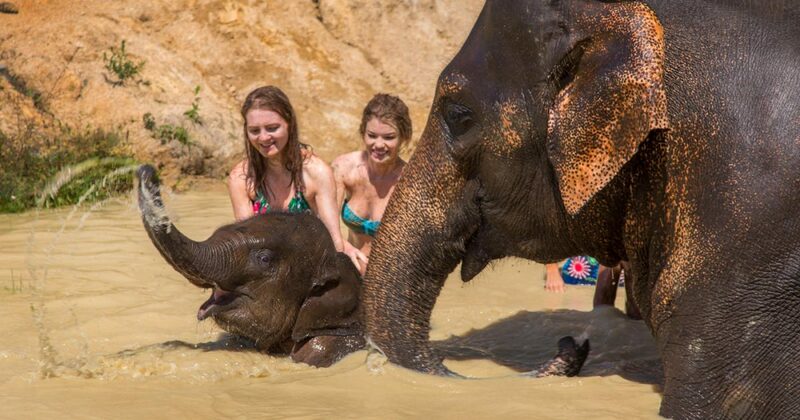 Where can I play with elephants in Phuket? Where is the Elephant Jungle Sanctuary? 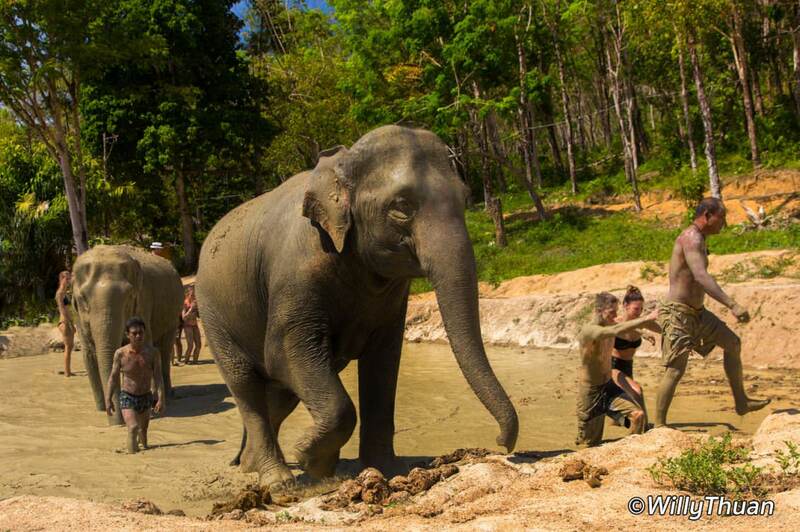 Yes, there are still many elephant trekking camps in Phuket, too many, but this new kind of rehabilitation camps is successfully showing the way. Old fashion trekking camps are changing fast because visitors have already changed. The trend seems to be working as more and more elephant trekking camp seized that golden opportunity and recycled themselves into elephant sanctuaries. Wise move! When you arrive at Phuket Elephant Jungle Sanctuary camp of Naithon Beach, you first get a short briefing. Usually, people book the morning or afternoon visit and are picked up directly from their hotels, which is very convenient. First, you will get a short briefing about the rehabilitation camps and its purpose. 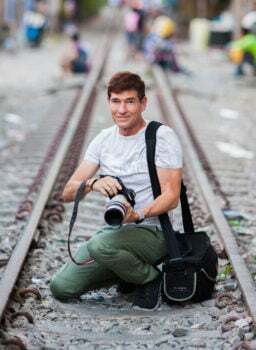 Learn about the elephants, their burden with the old-fashioned tourism, which is unfortunately still well alive in Phuket and many parts of Thailand. Learn how the Elephant Jungle Sanctuary is trying to change mentalities while offering a unique experience. In their approach, this sanctuary invites you to bathe with those gentle giants because they are not wild anymore but domesticated animals, allowing people to show them affection. Guests then are shown how to prepare food for the animals. It’s a bit messy, but fun and everyone seems to enjoy being useful. Once the food is ready, a small group of elephants arrive and eat from people’s hands. 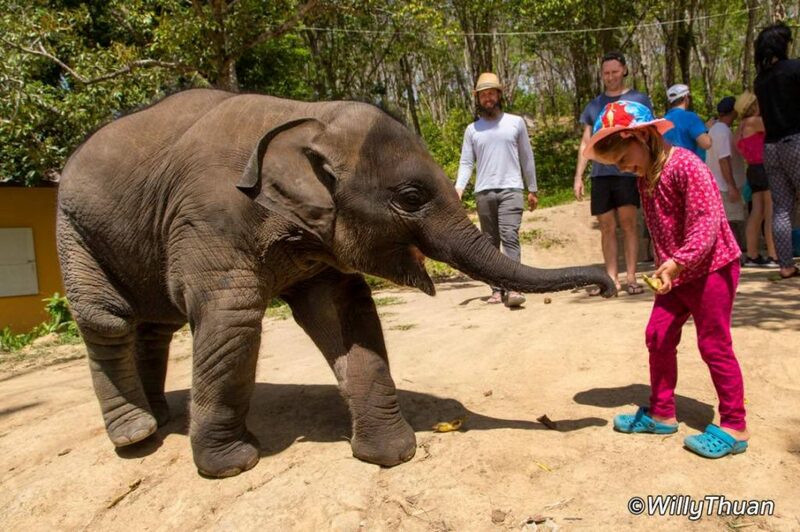 Kids are usually hesitant at first but quickly enjoy the playful baby elephants who look just as happy as human children are! The food is all gone a lot faster than you think and the group then walks to a nearby muddy water pond. Elephants run into the brown water and start enjoying themselves. Visitors are hesitant to jump into the water, but it doesn’t last long. 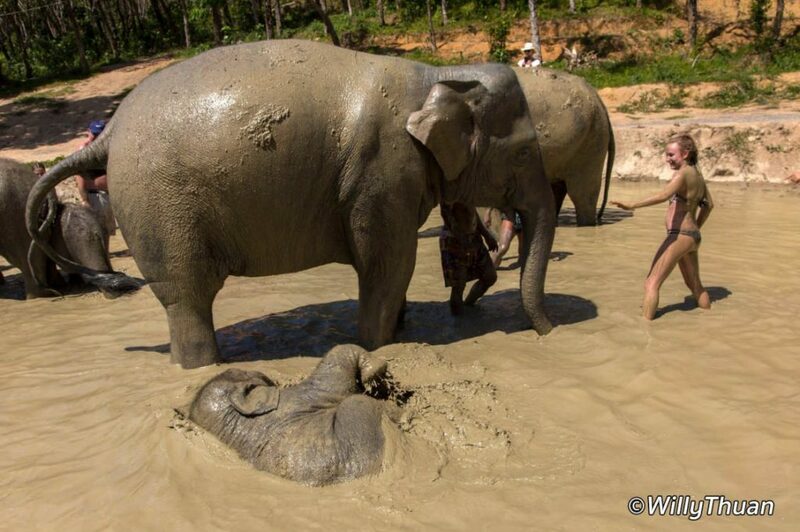 Soon everyone is in it splashing and rubbing the mammals with handfuls of mud. The group later moves to a clean water pond where everyone can rinse the mud away, and have another round of fun (not to mention memorable photos). This is a unique experience and elephants seems to enjoy the moment as much as the guests. 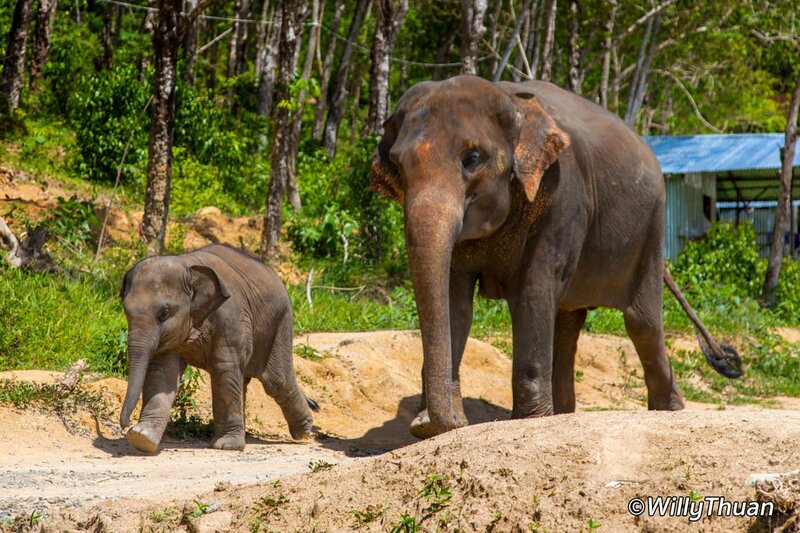 The Elephant Jungle Sanctuary Phuket is one of the new sanctuaries that are opening all around Thailand. Even if not all sanctuaries are perfect, they are changing travellers’ mind. With more sanctuaries, there will be less trekking, more education and more respect for these noble animals. 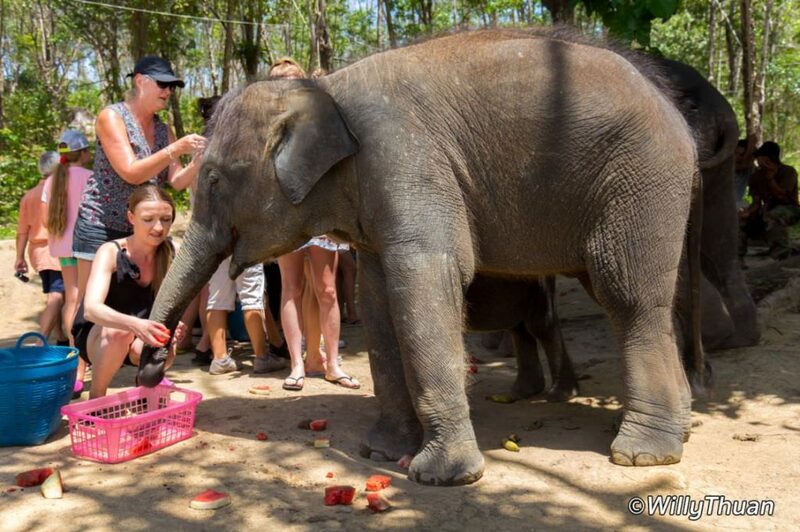 To book The Elephant Jungle Sanctuary Phuket is simple: talk to your hotel counter.